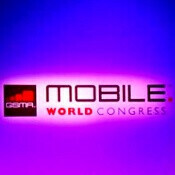 It’s just over a week since MWC 2012 wrapped up but it feels almost like an eternity. The new iPad was announced and as it was expected it eclipsed all current tablets, but could some of those upcoming gadgets shown at the Mobile World Congress be able to challenge Apple’s product? And what were the best phones and tablet unveiled at the largest mobile event for the year? We’ve waited for you to cast your votes in two categories: best phone and best tablet, and the results are finally in. 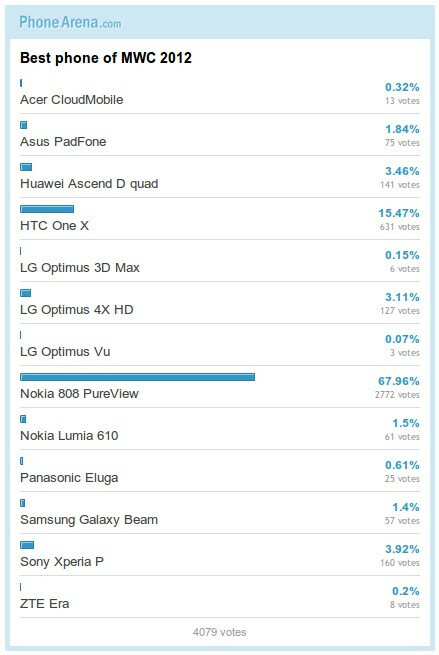 You picked the Nokia 808 PureView as the best phone at MWC 2012. With some 68% of your votes, it was a landslide victory for the Symbian-powered device bringing a mind-boggling 41-megapixel camera with PureView imaging technology for stunning images. Second ranked the HTC One X getting over 15% of your votes and it’s also worth an honorable mention. The One X embodies the latest technological advances - it will feature the 28nm power-efficient and LTE packing Snapdragon S4 dual-core chip in the US. The international version is stuffed with Nvidia’s Tegra 3 quad-core, which should match the performance of the S4 without offering LTE. Interestingly, all other devices got lost and only received a tiny fraction of your votes despite some of them also featuring a quad-core processor. And what about tablets? 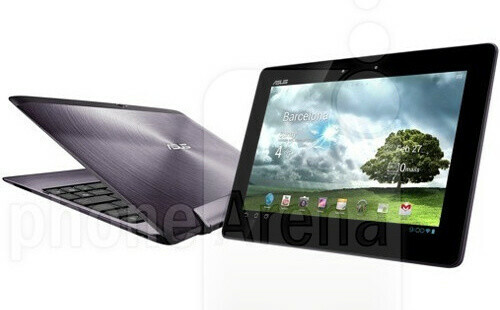 Almost uncontested, the Asus Transformer Pad Infinity 700 Series grabbed the gold with over half of your votes. It’s a premium product from top to bottom: high-res 10.1-inch display, elegant brushed aluminum back and featherweight body, and it comes with a keyboard dock. While its resolution falls short of the 2048x1536 pixel resolution of the new iPad, the Transformer Pad Infinity offers very impressive 1920x1200-pixel display. Its runner-up is the Samsung Galaxy Note 10.1. The device didn’t wow us with its hardware, but it’s definitely got that unique appeal of the S Pen interface and pressure sensitive display. 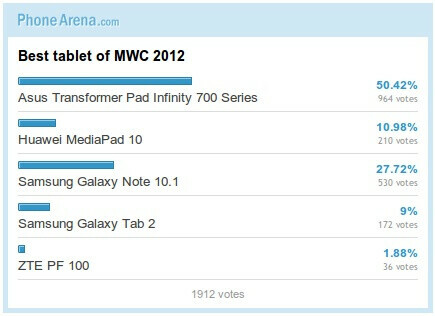 The Galaxy Note 10.1 got more than 27% of your votes. Now, the results are out and we’re curious to hear back from you once again - how do the winners stack up against the iPad 3 and has anyone changed their minds about the MWC phones? Let us know in the comments below. 15% gets honorable mention? Very funny. The only problem here is, no one is actually going to get the phone because the phone itself isn't that great. It's a phone, not your mother. Quit being so offended that someone has higher standards for a phone. Actually there's a LOT of talk online about people ditching their compact cameras, their Androids, their iPhones and their N8's (current best phone camera in the world until the 808 appears) and replacing them all with the 808 Pureview. Quite a few SLR owners too are wondering why they're carrying around bulky, heavy, very expensive SLR cameras when for many shots the 808 will be superior. Seriously, it's that good. yes.. i, too, agree that 808 is one of, if not the best device at MWC, quad core phones are great, but quad core technology was already introduced few months prior, the good thing is that it is making ways to phones in MWC.. but that camera sensor, that's a really new thing! but again, the best device doesn't mean it will grab the most sales.. i voted for the 808 due to its technological breakthrough, but honestly speaking, i will not buy it.. i lean more for the honourable mention one..
Actually the phone is amazing. Tell me the truth: have you used Nokia Belle? Most people who've upgraded their phones to it think it's amazing, like having a whole new phone, and easily as good as iPhone or Android. People will still have their preferences of course, but there is just no way you can claim the phone is not amazing. The features in the hardware and in Symbian beat every other phone on the planet hands down. The screen res is fine because you can't see the pixels in normal use anyway so higher res screen is totally pointless. Unlike Android, Symbian does not need a fast processor. N8 with 680 Mhz processor and Belle is clearly faster than many 1GHz+ Androids. However, the 808 Pureview has a 1.3 Ghz processor, it also has probably the most powerful GPU out there, and again unlike Android, Symbian uses the GPU fully for most of the OS and UI. Furthermore, Nokia have always been renowned at making phones with far better build quality, signal strength, battery life, call quality and so on than ANY of the competition. This is proven time and time again. The fact is they have all this in the 808, an even better OS again with Belle Feature Pack 1 (which no one has used yet in public) and they have just produced a camera that beats everything else in the world inside or outside a phone, hands down. Sorry dude, but that's the facts, and you're going to have to accept it! Judging by the incredible reception the 808 has got it will sell millions and millions and millions. I Think software in phones is becoming a bit thrashed. All platforms give you a great experience. Nokia nailed it concentrating on hardware like nobody else. Apart from the well mentioned camera, things like a fm transmitter, super high quality sound recording and have you seen that screen they've been using on there phones of late, its totally viewable in direct sunlight. This phone packs a punch that I'm sure manufactures felt cause they know when all that stuff hits the windows platform as well it'll be a force. It was nice of Phone Arena to talk about the actual poll and those devices announced at MWC in-between references of the iPad 3 which had nothing to do with MWC. Very professional, Victor. I am curious how the 808 sells. There is a ton of buzz about it. I am actually very happy Symbian fans have something to be excited about! Well the poll says it all. Its not always about the number of cores or screen resolution all the time. Even the 808 has a seemingly inferior processor and screen resolution, people still like it. I don't think any body takes out their phone to look at the screen and see if there are any visible pixels. Neither do they check out what the processor is run like at any given moment, coz it doesn't really matter when the phone does what its supposed to do. And then i wonder how the ipad made it into this article, which was about phones and tablets from MWC! U have some good points, but in general your definition of smartphone is wrong. Web browsing is only one of many things important in smartphones.